The University of Maine at Presque Isle Fine Art Program faculty members are pleased to announce the four solo exhibitions developed through the 2015 Fine Art Senior Thesis Exhibition course. The series of exhibitions will be hosted in the Pullen Art Gallery starting in April and continuing through May. The Fine Art Senior Thesis Exhibition, a six credit, academic-year-long course, is a capstone to the BFA program. The rigorous course of study is unique to most statewide BFA programs. The Senior Show allows enrolled students to have an experience similar to a graduate school environment. Students are required to prepare a body of work for the solo exhibition and defend it orally and in writing, in order to graduate. 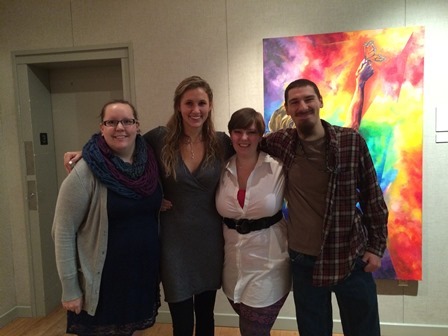 The students featured this year are Jessalyn Levesque, Dylan Markie, Renee Royal, and Chelsea Searles. Dylan Markie is a Christian artist who prefers working with scrap materials that he finds. He considers himself to be a combination of both a fine and folk artist. In this body of work, he is focusing on the spiritual peace that God can provide using his struggles with stress and his journey to find peace as a personal testimony. Markie’s exhibit, Anxious for Peace, opened April 10 and will run through April 16. Chelsea Searles is a mixed media artist who has grown up in Van Buren. Her work consists of different aspects of life and death, as well as near-death experiences, through the use of skulls (death), flowers (life), and various patterns, akin to the patterns faced in life daily. Through this, Searles is attempting to find the true connections between life and death, and illustrate to her viewers that both can be a pleasurable experience. Searles’ exhibit, Death Blooms, will open April 24 and run through April 30. Her reception is from 5-7 p.m. on April 24. Renee Royal is a painter whose chosen medium is acrylic paint. Her highly colorful body of work explores the hopefulness that daydreams and memories can bring to an individual. Royal’s exhibit, Elsewhere, opens May 1 and runs through May 7. Her reception is from 6-8 p.m. on May 1. Her show takes place during the First Friday Art Walk. Jessalyn Levesque is a mixed media artist who works in multiple mediums, but is currently studying the relationship between plaster gauze and silk. The main focus of her work is development of identity, loss of identity, and reconstruction of identity through the investigation of loss and attachment in the familial unit. Levesque’s exhibit, Ipseity, will open May 8 and run through May 17. Her reception is from 5-7 p.m. on May 8. Levesque’s show will be open during UMPI Commencement weekend. 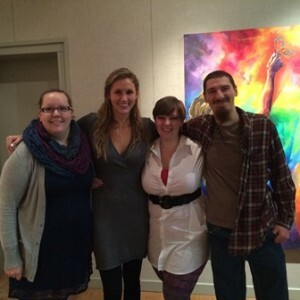 The Fine Art Department commends the efforts of this year’s BFA students. They have been responsible for all aspects of their exhibition, from making the frames and labels for their pieces, to advertising and promoting their show to the campus and community, to arranging for their art receptions (including food and music), to developing their final artist’s statement, to preparing their gallery talk. As a final component of this year-long project, students must turn in their final thesis, an in-depth research paper about their work and the art, artists that influenced it, and their aesthetic decisions. Members of the campus and community are invited to view each show that will be on display this spring in the Pullen Art Gallery and attend all show receptions. For additional information, please contact Heather Sincavage, UMPI Assistant Professor of Fine Art, at heather.sincavage@maine.edu.